In December 2001, our guest speaker was Dr Lilian Hobbs talking about "Robotic Astronomy for Amateurs and Societies" or as Lilian suggests: "How to do Astronomy inside, in the warm!" By day she works as a software engineer for Oracle, but at night she uses her technical and computer skills to concentrate on her other passion – astronomy. She has already been featured this year in the popular astronomy magazine "Astronomy Now" and her own website www.lilianhobbs.com includes information all about her telescope and its housing as well as data from her very own weather station, situated over her garage. One of her projects is to photograph all the Messier Objects. These are a catalogue of sky objects that French astronomer Charles Messier identified that could have been mistaken for comets. The astronomers of the time were more interested in identifying new comets and not these other objects, which include nebulae, galaxies and clusters of stars. They have now become an area of study in their own right and you can see some of their images on Stratford Astronomical Society's own website www.astro.org.uk in the Images Gallery. Look for the pictures entitled with the prefix M and then a number e.g. M31. To capture pictures of these and other objects Lilian uses a computer-controlled telescope that she operates by remote control from her house. Her telescope, a 12" Meade LX200, lives in a small white fibreglass dome at the end of her garden about 30 metres from her house. There are two computers in the dome along with a number of CCD cameras and other gadgets. The CCD cameras are just like other digital cameras, which capture and store light electronically instead of exposing rolls of film. 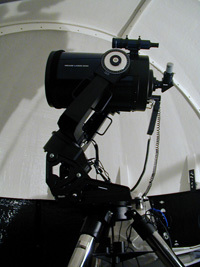 The more powerful Pentium 400 computer system is used to operate the telescope and an SBIG ST7E CCD camera. The less powerful 486 is dedicated to operating a Lynx CCD camera. To save space and expense, these computers are set up to share one monitor, keyboard and mouse. Lilian emphasised that you didn't need the latest computer system to drive a telescope or run most astronomical software and a lot of software is available over the internet as either shareware or freeware. To communicate with the computers in the dome Lilian uses a computer in her house that is connected to the others using ordinary networking techniques. This involves having a network card in each computer and running a computer cable between the house and dome. The cable is protected by feeding it through a hosepipe and so far it has proved reliable even at some very low temperatures. Her house has become a popular venue for members of Southampton Astronomical Society of which she is a member. Observing evenings are always well attended with members often commenting that it has been the first time they have seen some objects such as the outer planets. The dome itself is not remote-controlled and so depending on where in the sky she wants to observe Lilian has to make a quick trip down the garden to reposition it. The only hazard she has found with this is in the autumn when her pear tree begins to shed its harvest. The ripe fallen pears attract the local hedgehogs, which can put on a surprising turn of speed when startled. After a number of near misses Lilian has taken to carrying a torch down the garden when visiting the dome, not because she doesn't know the way but just in case one of her garden guests hasn't quite mastered the "lawn-cross" code.